The following two photos are of my target stand. It has evolved over a couple of years. The first shows what it looks like when I shoot from 25 metres away, the second has the target box opened to show how the metal strips are arranged inside and how the target (which is a standard piece of copy paper with red stationery store dots on it) is trapped under the front when it is lowered. There are two small spikes at the top, and the frame has two screws sticking through on the bottom to trap it in place. 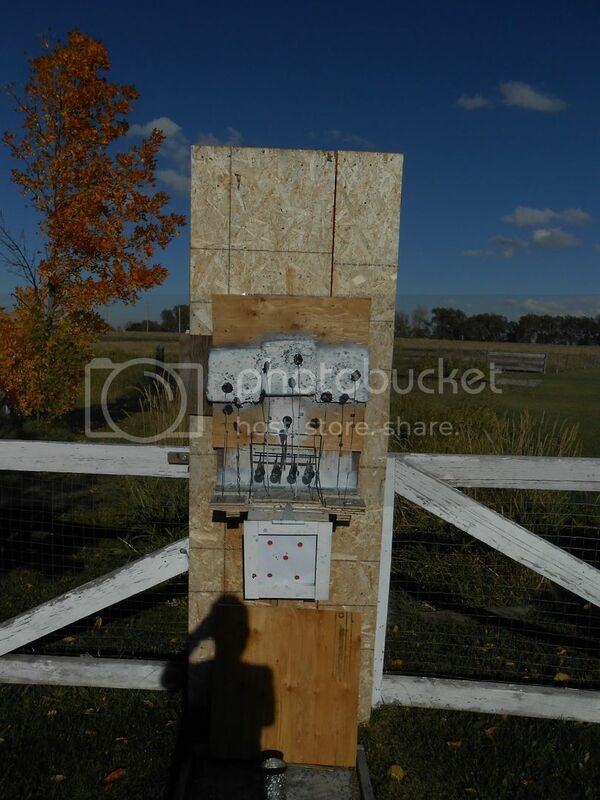 The hole in the bottom of the box was to set it on a steel fence post, but now it has a sliding cover (a tin can top) and catches some pellets. The rest wait for me to open the front, and I then dump them into a tin can seen below. The frame cover of the target box is 1/8" x 2" steel strapping and the back inside is clad in the same thing. The pieces in the back are hung loosely from ordinary decking screws with a chunk of old denim jacket behind them to help absorb the shock. A coat hanger wire holds them back, and a couple of screws keep them edge to edge. I get tiny shrapnel holes in the targets sometimes, but never anything of any size. The target box just hangs on a shelf. At the back of the shelf is a piece of heavy angle iron with a groove in the bottom. I used to set the bright red pull tabs from my favourite beverage in the slot, but they don't have them any more. Also on the shelf is a standard pop-up/resetting target. Stuck into the shelf are coat-hanger wires with lead discs on the top. The discs are great fun to shoot. Sometimes they spin around and so sometimes one has to shoot at the edge. When they are hit solidly, they bob and weave all over the place. Also when hit, they sometimes make a tiny "click" noise, or no noise audible to me at all. Then I just smile and watch them bounce around. If I miss about 3 times in a row, I go back down to the target to see where I'm shooting. The cake pan makes the back-stops which are also made of used pellets. I got the idea for re-cycling the lead from someone else, probably here and it works great. The pellets stick, and eventually I cut up and re-cycle the back-stops and discs. I like your setup because they are reactive targets...I like to see things DO something when they're hit.....its so much more entertaining.I use small soup cans, plastic aspirin or vitamin bottles, pellet tins, etc.Its just cool to see how they react....anyway....good job on your target construction....well done..
Agree with previous post on all counts. I agree as well! Fun to hit reactive targets! 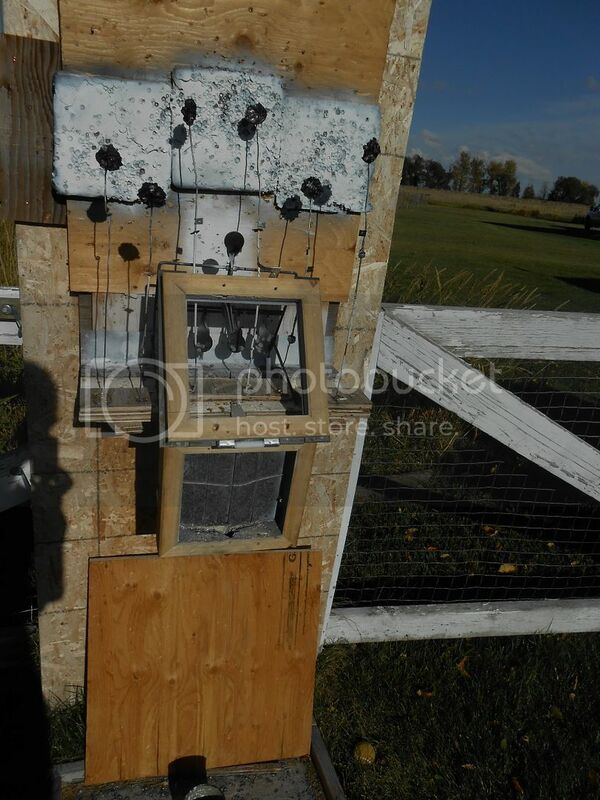 Looks like a fun and interesting shooting area. Nice setup you have Peter. And a beautiful setting as well. Nice, Peter, but why does my radar get such a high Photoshop reading? No offence intended - just curious. No really I would love to be able to shoot in my backyard in a setting like yours. Enjoy! I enjoy the set-up and shoot a lot since I'm retired. That's what it looks like. I'm not computer literate so I wouldn't know how to photo-shop anything. No offense taken. I live on the edge of the village and there actually is an abandoned house about 200 yards behind the target stand. I shoot from about 84 feet away (keeping the shed between me and the prevailing wind) which is why I call it 25 meters. We have a 1/2 lot here, but full lots are 1/3 acre. It's nice. And it's really quiet. Except for the occasional pop of an air gun. And there one of the things I love about air guns!....I would have to think long and hard about even taking a lowly .22RF to that spot...probably wouldnt risk it, but with that distance, and open field, I think your odds of being hit by a meteorite are greater than the pellet missing or going through the backstop and hitting anything. Nice to shoot outside when the weather permits. Winter seems to be here now, so it's indoors until Spring comes. 25 yards is the longest distance we have indoors, which is this settup. I see a kettle, so all it needs is a hot cup of tea and a plate of biscuits on the table. LOL - yes - if you wish to have tea for coffee - also a 30 cup percolator - there are two refrigerators for cold beverages. wow-- nice. what have you got a gym off of your kitchen. This is the club-house at the local Rod and Gun club. We used to shoot RF kid's instruction in the evenings - 20 yards, along with CF handgun, up until about 1982. The baffles are still there, behind the dona-cona 4'x8's. 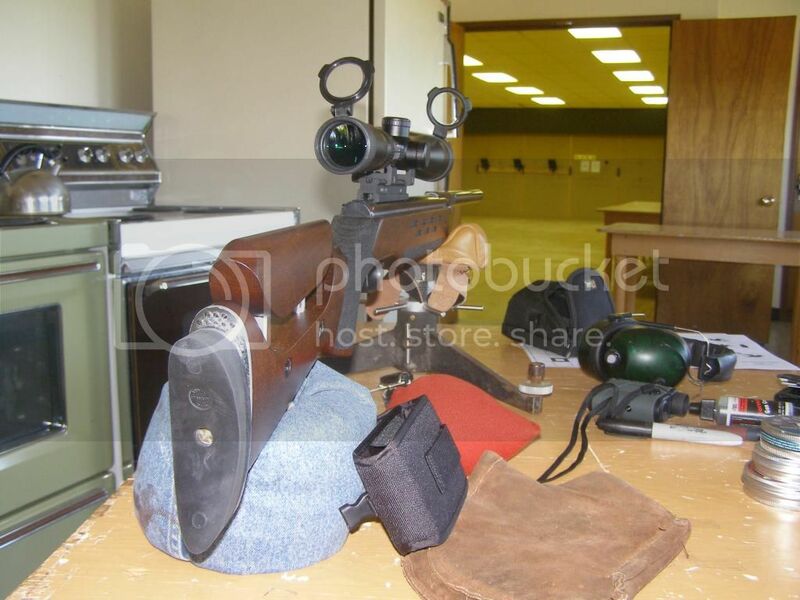 The ventilation fans are not up to code nowadays, for RF or Cf shooting but work just fine for air rifle. The local Rocky Mountain Ranger's 'group' use the range for hiking and crafts and put down sleeping mats for the weekend stay-over. The baffles will stop ANY air rifle projectiles, so calibre or power level is not a problem. Every Sunday Morning 10:00AM to noon is 10 meter air rifle. Every Wednesday evening, 7PM on, is anything goes, from pellet testing to 10 meter target - or running game, whatever. Every Friday evening, 7PM on is air rifle silhouette. 1st Monday every month 7PM - monthly club meeting in the club house. This location, within the city limits (West edge) has been in operation since it started 1946. We now also have a 1,100 meter range out of town, with 15" steel plates from 200 to 500 meters, then at 700, 900, and 1,100 meters as well as a 4' x 8' steel 'buffalo' hanging at 1,000 meters along with an 8'x8' square steel frame that takes standard 8' studs for attaching paper targets. I have been a member and/or part of the Club Executive since February 1979, when I moved to P.G as a 29 year old kid. Because I am on the executive, I have a key for the door along with a pass code for the alarm system. Thus, in the winter months I have access for air rifle testing - the heater works great, so but we require a $3.00 fee ea: for the use of the club house in the winter time for the electricity (lights and fans) and gas furnace. Thus, my friends (members only) have access with me for shooting to 25 meters in the winter time.